Long-time Participatory Plant Breeding farmer Stewart Wells stands near wheat plots on his operation near Swift Current, Sask. | Photo courtesy of Katherine Stanley. Not many farmers can say they’ve had a hand in early-stage selection of the very crops they’re growing in their fields, but the University of Manitoba’s Participatory Plant Breeding Program is making this possible for producers coast-to-coast. The program’s goal is to allow farmers to have a direct hand in crop variety development. 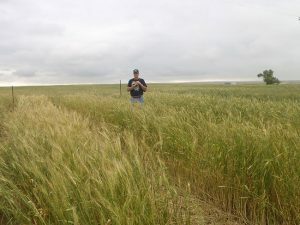 Collaborating with plant scientists and breeders, farmers are invited to plant new cultivars of wheat, oats and potatoes and make selections on their farms with the ultimate aim of developing varieties that are ideally suited to their unique needs and growing conditions. The program was started in 2011 by instructor Gary Martens and technician Iris Vaisman in collaboration with Agriculture and Agri-Food Canada (AAFC) wheat breeder Stephen Fox. Today the program is run by the University of Manitoba’s Martin Entz and co-ordinator Michelle Carkner. Funding comes from AAFC and the Bauta Family Initiative on Canadian Seed Security. Entz and Carkner now do the wheat crosses themselves and offer oat crosses from Jennifer Mitchell Fetch at AAFC’s Brandon Research Centre. They also offer open-pollinated potato varieties developed by Duane Falk at the University of Guelph. In its seven years of existence, the program has seen involvement from more than 100 producers across the country. Entz and Carkner aim to visit most of the program’s farmers at least once during the growing season to talk to them about selections and the challenges.This year, participating farmers planted a wide variety of wheat crosses with varying characteristics, such as a Unity/Red Fife cross, an AAC Scotia/Norwell cross and a Carberry/AC Tradition cross. Oat crosses, mostly between numbered cultivars, had parentage with varying disease resistance, yield potential and oil content. First, Carkner and Entz grow out wheat populations to the F3 generation. Then Carkner sends participants the lists of wheat and oat populations available for the coming season; the lists include information on parentage and agronomic characteristics. Producers make selections (with Carkner’s and Entz’s help, if required) and are sent enough seed for a 20 square metre plot (about 5,000 seeds) per variety. The producers can choose whether to grow out one or two varieties, or up to five or six, depending on their comfort level. Farmers seed the plots by hand or using garden seeders. They’re provided with materials to guide them through the selection process based on their local needs. “If it’s disease or rust they’re concerned about, for example, we tell them when to go out and select for that. If they want something that is later maturing or early maturing, we tell them when to do that,” Carkner says. Farmers select about 500 spikes or panicles and send them back to the University of Manitoba, where some are archived. This year, Carkner increased seed for three farmers on the wheat side and two on the oat side. In the future, she hopes the program will shift its emphasis from breeding to increasing seed. Carkner says the program has two main challenges. The first stems from increasing seed: the University of Manitoba has the resources to increase seed for a good number of farmers, but shipping enough seed back to farmers for them to move from the garden seeder to the drill is a major enterprise. The second challenge relates to registration. Carkner and Entz currently offer the breeding lines to Brandon Research Centre and anyone else who wants to develop them. But they’re also open to working with farmers who want to pursue their own avenues to marketing. Not all the farmers in the program are organic, but the program works particularly well for niche producers with markets for unregistered varieties. Ian Cushon, who runs an organic grain and oilseed farm near Oxbow, Sask., is a long-term member of the program. This year, he asked Carkner to scale up one wheat population so he can take it to the next level in his operation. It’s an experiment, because until Cushon gets enough volume to grow out a significant amount of the seed, it’s hard to test it – both for quality baking characteristics and for market accessibility. The program takes some commitment during the busiest times of the season, Cushon says, but it doesn’t take much time because the plots are small. Producers need to be fairly knowledgeable about diseases and negative qualities to watch out for, but these are skills that farmers, for the most part, already have.